and Dr. Bruce Torrance on their NFL Debut! The department of surgery features 3 annual lectureships: Isidore Cohn, Jr – James D. Rives Annual Visiting Professorship in Surgery, Claude Craighead Visiting Professorship in Vascular Surgery and Irving & Mrs. Lillian Levin Annual Lectureship Series in Colon & Rectal Surgery. This year's Surgical Intern Bootcamp, a two-day course for new interns within the General Surgery program, was held on July 19-21, 2018. The intensive course focuses on teaching key cognitive and technical skills to help interns ease into their new role. It includes didactic lectures as well as skills labs using animate, inanimate, and organic simulation models. 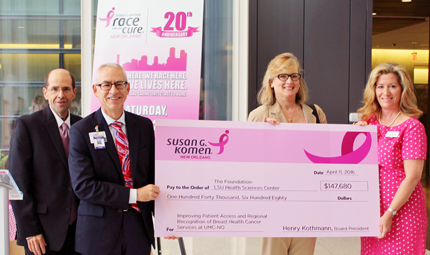 The Department of Surgery and the LSU Foundation for the LSU Health Sciences Center received $147,680 Susan G. Komen Funding for improving patient access and regional recognition at UMC-NO. 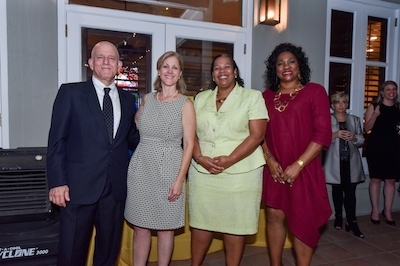 Dr. Riker and Ms. South (pictured second and third from left) accepted the award at a ceremony at UMC-NO. Congratulations to 2016 Winners of SOM Alumni Excellence Awards! 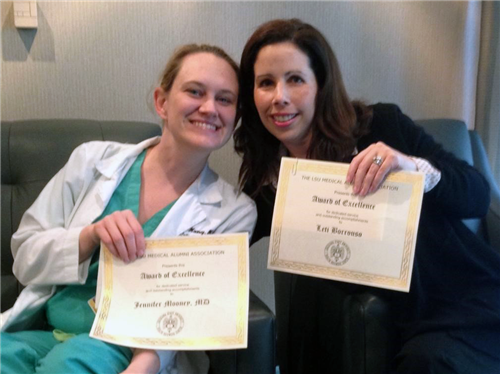 Congratulations to Dr. Jennifer Mooney and Leti Borrouso who were 2016 School of Medicine Alumni Excellence Awards recipients. They were nominated by their peers and the award signifies excellence in performance of job duties, integrity and work ethic, and recognition as being team players by others in the institution. The half-day training sessions were held in the Advanced Practice Center at the LSU School of Medicine and led by Malachi Sheahan, M.D., Program Director, Vascular Surgery Fellowship, LSU Health Sciences Center on May 28, 2018. Dr. Sheahan led the pedal/popliteal access demonstration, using cadavers and ultrasound. He implored the Fellows that accessing the popliteal "takes a lot of practice," and Fellows were invited to try to access the arteries on their own. The casual setting encouraged teamwork amongst their peers.